As we already noted in our ultimate guide on best Insta air mattresses, this never-flat air bed has been “killing it” sales-wise for the past 2 years or so, it’s been the best Insta air mattress for 28 months now. The numbers say this Insta-Bed air mattress is their top-selling model, so it’s no wonder it’s been reigning our guide dedicated to this brand for ages. Watch a quick demonstration of how the Never-Flat pump works. We update our reviews and ultimate guides every two months, and this never-flat air mattress really made it into a dull chore. It’s been on the very top of Insta beds for almost a full year now. Let’s take a look at how this piece of inflatable furniture fared against our rating categories. With all that ratings out in the clear, we can give you a comparative view of this model and (in our opinion), the best inflatable bed we’ve seen so far. Here are all the categories side by side; just bear in mind we ARE comparing this Insta with the “big kahuna” of our site. With that in mind, we are more than pleased with how it did and we can definitely see why it has more than 3.5k user reviews on Amazon. Buyers just love this model for some reason, and we’ll get to the bottom of it. They also provide some additional facts we’ll talk about a bit later. Not the most thrilling product specification we’ve ever seen, but it gets the point across and gives us a good foundation to build upon. We were really in a pinch with our sleeping arrangements while the house was redecorated. We went on Amazon and just bought the inflatable bed with the highest number of reviews. Most of them were positive, so we felt good. It’s a perfect temporary solution for you or the guests. It holds my hubby and me no problem, and it doesn’t leak air AT ALL! As we said in our ultimate Insta guide, if some model goes like crazy, we definitely want to take a look behind that curtain. If this was a short-term hype, we’d have a completely different story on our hands. This model was killing it since 2012, as we mentioned, so that can’t be just a fluke. People generally enjoy this bed, and have been for a very long time now. The size is the first thing we’ll mention here. Air mattresses are notorious for always being “shy” a couple of inches. You just bought a Twin-Size model, for example, only to find out it’s shorter and narrower than that. Here, however, they got it completely right. You sheets will fit like a glove, and you’ll get exactly the size you ordered; to an inch. We measured three of these during our in-house tests, and they were all right on the money as far as sizing goes. We’ve conducted our pressure test with 100lbs more than the advertised limit. Insta states this bed can hold up to 500lbs, and we ended up putting 600lbs of weights on it and left it overnight. Imagine our surprise when we saw it in the morning. It was just standing there, almost no air lost thanks to the NeverFlat pump. The PVC used for this one also makes it more pierce-resistant, which is crucial if you decide to take this bad boy outside and start hitting some trails and camp sites. 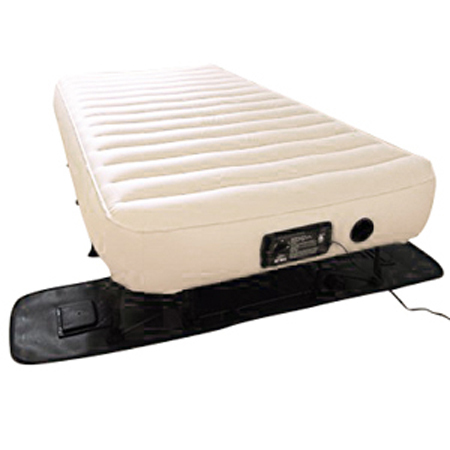 It’s also tested and confirmed to be free of any toxic chemicals that can find their way into lower quality airbeds. We also liked the inner construction of the bed. Circular coils are the closest thing to innerspring an inflatable mattress can have. They’re there to provide structural soundness and give a proper support to the sleeper. So, these are excellent for painful backs, sore muscles in the morning or stiff joints. We’ve always liked coil-filled interior than beam design anyway. Other than that, in terms of design it’s very similar to its somewhat inferior “cousin” – the Insta with Insta III pump. The bottom is “sure grip”, which means you won’t have any problems with your mattress sliding from one end of the room to the other during the night. The top is flocked, very comfortable and hold sheets perfectly in place. NeverFLAT pump is a feature we can write a whole guide about, and we probably already did over time. It’s a very convenient thing to have, especially since it’s absolutely soundless while it works. The pump is also featured in much more expensive Insta models, like the Insta EZ bed, which says a lot. Long story short, this is one heck of a product, as proved by our testers, the customers we’ve contacted and all the user reviews online, which are overwhelmingly positive and ridiculously numerous. We’ll update this review in exactly two months. We’ll bring you new ratings, some new test results and a lot of fresh user reports.